What materials are appropriate for infant and toddler pathways? Infant spaces do not require a pathway for push toys. We suggest a small space with undulating lawn, pull up bars and glider or rocking chairs. An area of poured-in-place rubber surfacing over concrete or a deck provide useful alternative surfaces if the ground is wet. 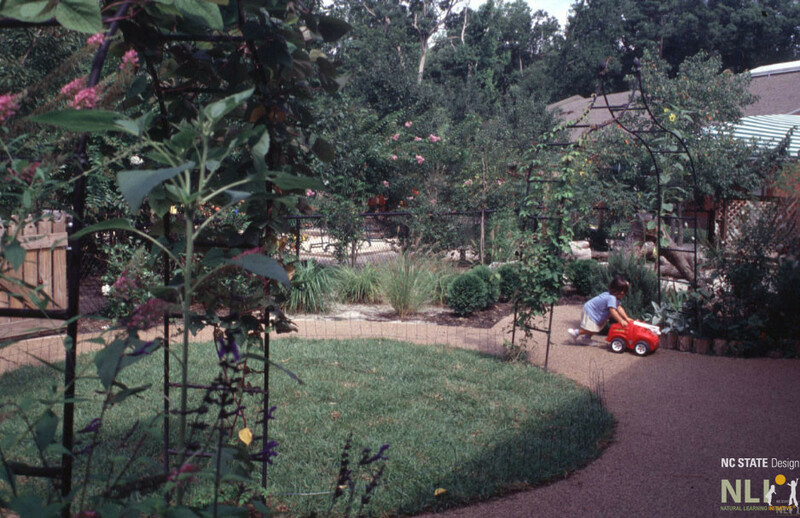 A stepping stone pathway or flagstone pathway with sensory ground cover planting can be provided for circulation. Poured-in-place rubber surfacing over concrete. Best practice recommendation for primary toddler pathways. The rubber surfacing protects children from injury. Typically this is used to cover all concrete surfaces where children will be learning to walk (12mo – 24mo). Some manufacturers also install poured-in-place on asphalt or compacted gravel surfaces. Costs differ based on the underlying surface. The life expectancy of poured-in-place is only as good as the underlying surface. Concrete lasts the longest, then asphalt, then compacted gravel. Since poured in place rubber surfacing is costly, considerations for the life cycle material costs need to be made. Aggregate/stone/decomposed granite. Can be used for primary or secondary pathways. If installed properly this can be considered an accessible surface. There are many varieties of aggregate pathways since the aggregate is generally mined from a local source. In order to provide a smooth, flat surface a fine material must be used in conjunction with a course layer of gravel underneath. This surface is not as hard as concrete, but will gradually become harder as it is used. Triple-shredded hardwood mulch. Can be used for primary or secondary pathways. Mulch is not accessible and requires more maintenance since it is lightweight and not fixed in place. It is the cheapest up front, but not recommended for wheeled toy tracks or pathways that will receive much traffic. Stepping stones/flagstones. Can be used for secondary or tertiary pathways. Using natural stone provides a richness and special quality that supports the idea of discovering the natural world. Infant space with arbor swing, stepping stone pathway, and poured-in-place surface at Bright Horizons Family Solutions CDC. 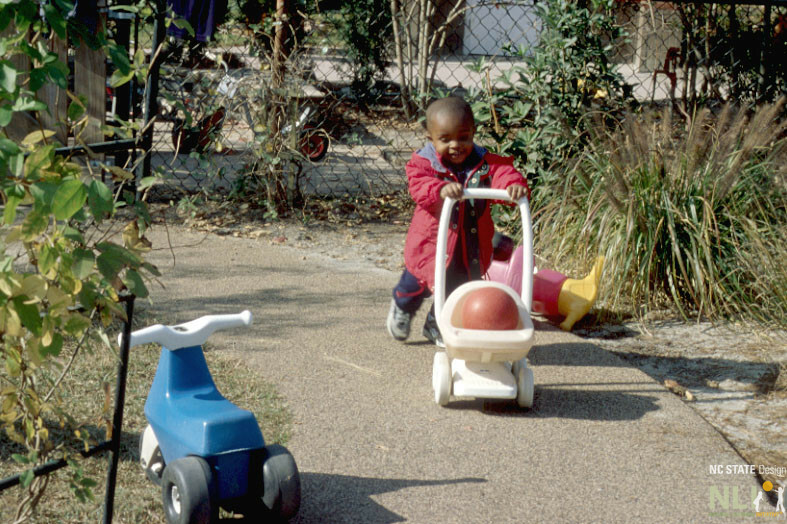 A toddler pushes a wheeled toy on a poured-in-place pathway at Bright Horizons Family Solutions CDC. 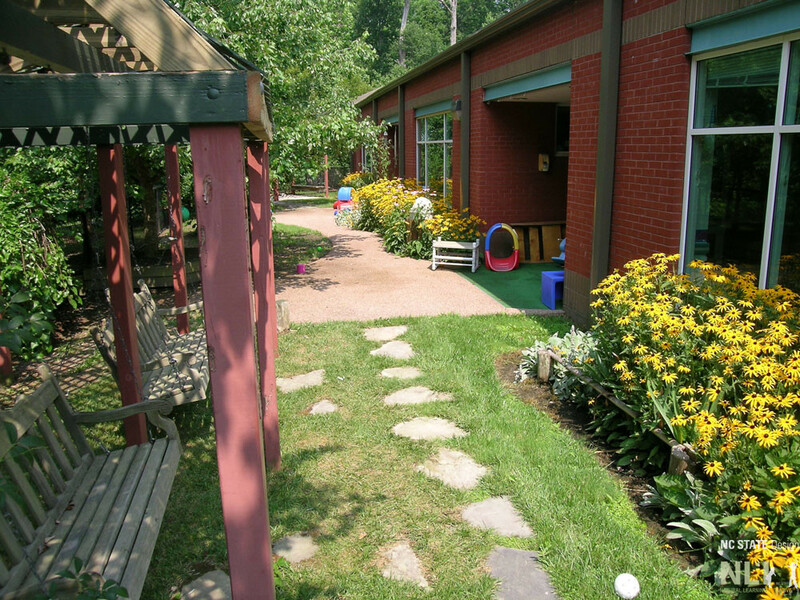 A poured-in-place pathway loops around a small multipurpose lawn at Bright Horizons Family Solutions CDC.